Welcome. Where has the time gone? I truly hadn’t realized it’s been this long since I’ve written on my blog. I promise to try to be better at posting. As I have written about before, one of the stamping companies I love is A Muse Stamps, located in Seattle. Every few months, a group of us, fondly called the New England A Muse Stamp Addicts, meet at one of our local scrapbook stores, Ink About It for a shoebox card swap. You design a card for the swap and put together kits for everyone and we spend the afternoon making cards. It was a fun, creative Sunday in late April. 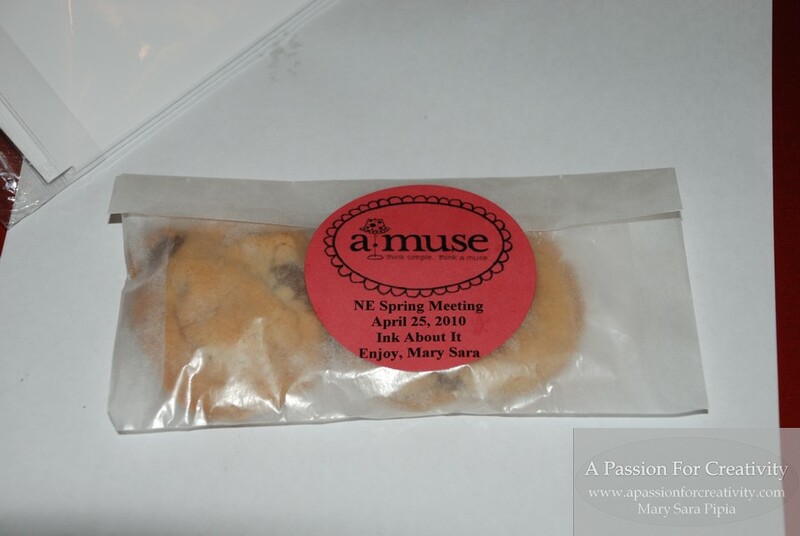 For a treat, I baked chocolate chip cookies and packaged them up in glassine bags and added personalized round labels I made on the computer. I found the bags and labels at my local Paper Source store. The glassine bags and labels make it fast and easy to do personalized labels for gifts. The sun was shinning and the weather was great in April and despite the allergy fog I seem to be in for most of the spring, I was inspired to do something different for my card design this time around. I used the Basic Grey Green at Heart paper collection, which I’m in love with and a touch of Bazzil green shimmer paper I had in my stash, which I think looks like the early morning dew on the grass. Sorry for the slight shawdow on the picture. 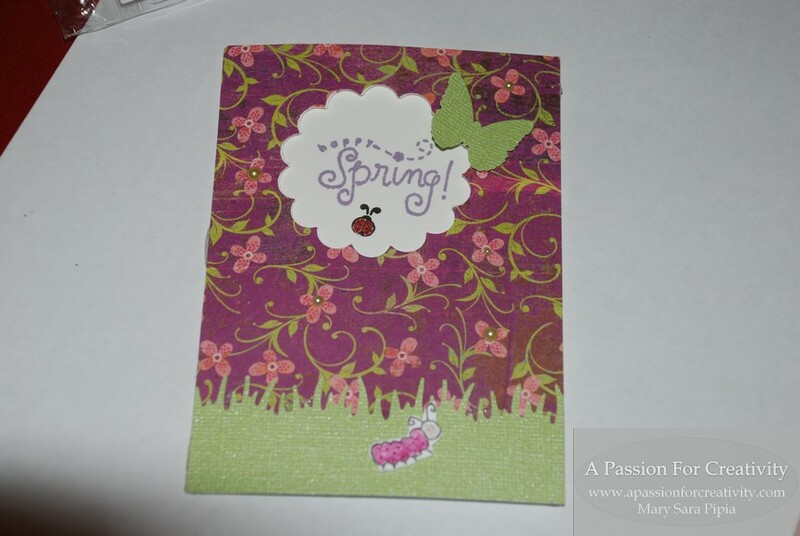 The A Muse stamps I used are the Happy Spring, caterpillar, and ladybug. How cute are they? I used a white 4-bar card as the base and punched the flower paper and card together with a 2″ scallop punch to get the “window” in the card and so the paper could fit on the front of the card. I then stamped the saying inside the “window” and the ladybug slightly off-center of the saying. For finishing touches, I used A Muse lime green pearls for random centers on the flowers and using Martha Stewart punches added the grass and butterfly. I love her punches. I stamped, cut out and colored the caterpillar and ladybug with Spica glitter pens in pink and red. I used Colorbox Chalk Ink in Wisteria to stamp the saying. 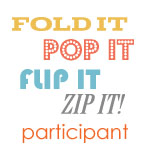 Colorful Creations in Hyannis, MA is hosting another shoebox swap in June. I’m working on my design now and it will be another fun day with fellow A Muse stamp addicts. You can find information about the swap on the A Muse Lounge or you can call the store. There might still be a few spots left if you wanted to join us. Lovers of A Muse stamps are a fun, welcoming group. Thanks for stopping by and check back again soon. Planning a few more posts to catch you up on some of creative times this winter and spring. Remember, do something creative today!